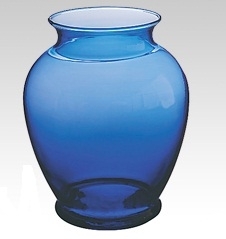 This vivid cobalt blue glass ginger vase combines old-world beauty with contemporary design to provide a stunning decorative accent. Called "ginger vases" because their shape derives from the containers once used to import ginger and other provisions from China, these elegantly curved vases have become a popular staple in Western home and business decor. This cobalt ginger vase is 7 1/4 inches high, with a 3 7/8 inch opening at the top. It makes a lovely flower vase with a wide variety of applications. Its simple elegance makes it appropriate for use as a centerpiece for your dining room or living room table, while its timeless design is sophisticated enough to grace even a formal occasion like a wedding reception dinner. The vase came quickly and was beautiful. I was a little put off that the shipping was more than the price of the vase. However, it was a beautiful vase and it arrived not broken. I will use this site again. Very reasonably priced. I love the vases but they are taller than the ad stated. They are supposed to be 61/4 inches tall, but are actually 8 inches tall. Don't think they counted the neck of the vase also. I am using them for centerpieces at a class reunion and am a little concerned they will be too tall with flowers in them. But I will keep. Too much trouble and expensive to return.